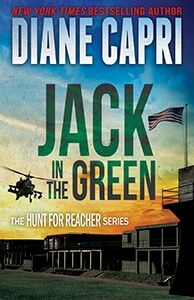 It’s not only my love for beach weather that compels me to set the Hunt for Justice Mystery Series in the Sunshine State. It’s the rich history. There’s also something about the contrast between the beautiful weather and mystery that makes stories more compelling, I think. Murder in Paradise is a tantalizing theme. Don’t you agree? 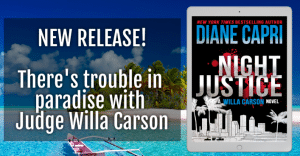 In my latest Hunt for Justice thriller, Night Justice, Judge Willa Carson kills a man. Or did she? Privately, the coroner says Evan Hayden was as good as dead from an overdose of toxic heroin when he lunged in front of Willa’s car. But the scandal mongers don’t know or care about the legal nuances. Last week we looked into Captain Tony’s Saloon, famous for bootlegging, pirates, and murder. This week we’ll explore another one of Florida’s hidden treasures. 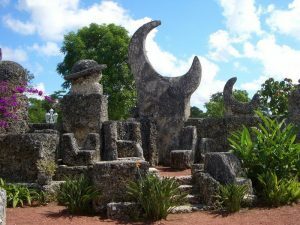 Have you heard of the Coral Castle? Although there’s no murder (that we know of!) surrounding this story, it has been dubbed by some as one of Florida’s great mysteries. 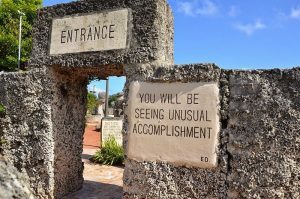 Located just off the South Dixie Highway in Homestead Florida, the Coral Castle has gained worldwide notoriety as an engineering marvel. Despite its name, the Castle is actually a park filled with huge sculptures made out of over 1,000 tons of oolite limestone. The Coral Castle was built single-handedly by one man, Edward Leedskalnin. Even more baffling is that Leedskalnin was small in stature, standing only 5 feet tall and weighing 100 pounds. He is also said to have had a very limited education, no higher than fourth grade. Against these odds, however, over a period of twenty-eight years, Leedskalnin built the park by himself using basic tools like picks, ropes, and pulleys. His labor of love continued until his death in 1951. So just how did Leedskalnin accomplish such a huge feat on his own? This is a question that has baffled engineers and scholars. The aura of mystery surrounding the creation of the site was heightened by Leedaskalnin’s sometimes strange behavior. He only worked at night and was known to espouse strong opinions. As a result, wild stories emerged that Leedskalnin had used levitation or magic powers to build his masterpiece. Despite the rumors, the answer to this mystery is actually fairly straightforward. The oolite rock that Leedskalnin used is very porous and thus lighter weight than it appears. Although still impressive, Leedasklnin simply used determination and the principles of leverage to create to Coral Castle. What say you? 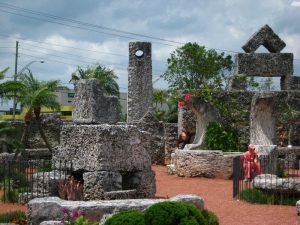 Have you visited Coral Castle? What did you think? Unlike the mystery of the Coral Castle, the mystery surrounding Judge Willa Carson’s supposed murder won’t be solved as easily. Start reading NIGHT JUSTICE now and you’ll be glued to the page! Buy your copy of Night Justice HERE.